At times, discernment can be a very hard thing. When we were told, on Thursday of last week, it would likely take 10 business days to process Jamil’s passport, we were shocked. Jay began problem solving. We made the decision to fly home on the following Tuesday night. We had talked to Jamil about the options. We would pray we would get his passport sooner. If we did, then we would adjust our plan. Monday, mid-afternoon, I said to Jamil that I really hoped we’d hear something about his passport. He said, “We will pray.” Monday, late afternoon, we received word that the passport had been approved and should be ready to pick on Wednesday. So, we decided we should postpone our flight. Again, we began planning our next steps. If we could get the numbers we needed from the passport, we could get online to get in line for the US Embassy for his needed visa. We could potentially be back to the States before another weekend passed. God is good, all the time God is good. With expectation in our hearts, we kept working on Jamil’s schoolwork, enjoying our time with Kate and Jemimah, and missing Jake, Jared, and Jayne. Since Jamil came to stay with us on June 5th, he has been very joyful, jovial, and teachable. The first time I saw a shift in this was the night of July 1st, when we took April to the airport. I didn’t realize it until later, but he was having a hard time with her departure. I came to realize this more fully, when he found out Jake, Jared, and Jayne would be flying home, without us, a couple of weeks ago. I asked him what was wrong, and he would only admit to having a headache. Later in the day of their departure, he acknowledged with a few tears that he was sad because they were leaving. We talked about it is okay to feel sad. We all do at times. God gave us emotions. My heart had broken the Tuesday before when I realized the judge was not yet willing to give us temporary guardianship of Jamil until our court file was more complete. After my tears subsided, I realized the judge did not close the door….he just needed more information before we could walk through it. As we quickly gathered information on our end and Jamil’s end, we were excited to know on Wednesday afternoon that our file was complete enough for him, and he would grant the written ruling the following Tuesday. Our attorney said both Jay and I would need to stay. So, the decision was made for the kid’s to travel without us. Previously as we contemplated their travel without one of us, we were torn and didn’t have peace for this. We never want to live with regret. If we sent them to the US by our choice alone, what if something happened?? The Lord had given us clear discernment, we should stay and they could leave. God is good all the time, all the time God is good. The next 24 hours are chronicled in the blog “Waiting Here for You”. I have a couple of things that left an indelible mark, on me, from our scavenger hunt adventure. 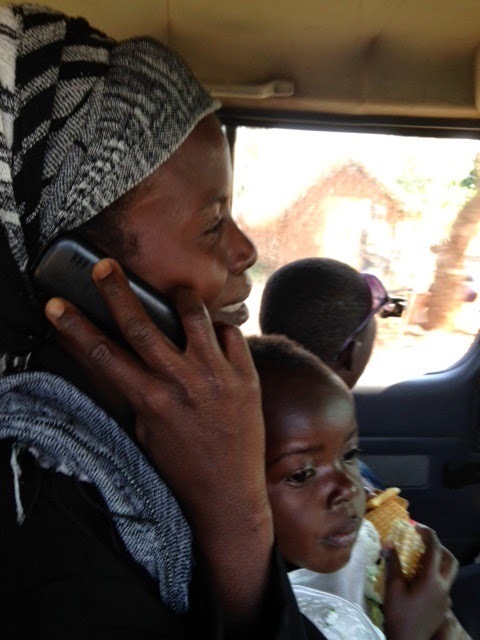 First, to hear Robina, Jamil’s mother, as she talked to her parents on the phone for the first time in a very long time. I could hear the excitement and rejoicing through the phone in each of her parent’s voices. I was reminded of the story of the prodigal son. Second, Jamil had never met the relatives of his biological father. Upon returning from our adventure he said, “I have a really big family. 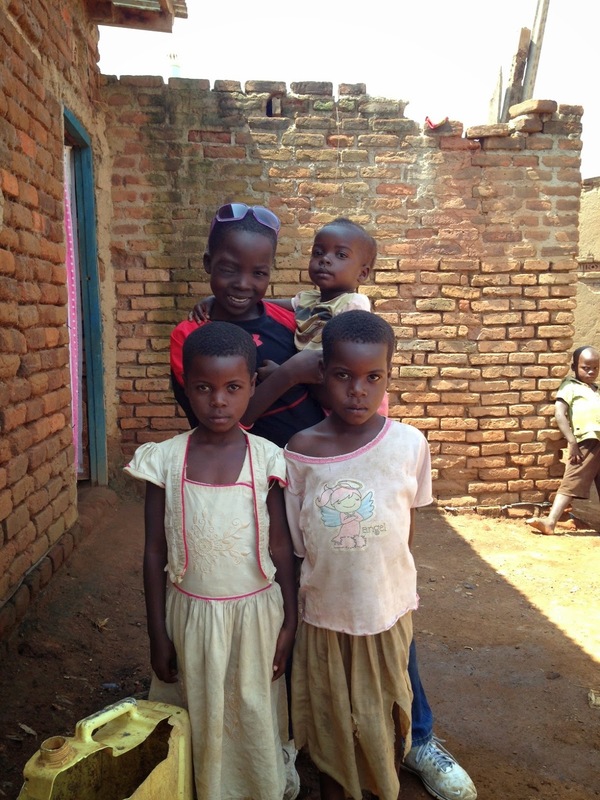 I didn’t make it to see all of their houses.” The biggest imprint in my mind and heart is when we said goodbye to his mother, in Jinja, at the end of the day. I gave her a hug, she only shook Jamil’s hand. When we returned to court on Tuesday, we were delayed again because of the new information our attorney presented from our scavenger hunt. The judge seemed pleased that we had gathered the information and verbally stated that he would grant us temporary guardianship, but he would need to add it to his written ruling. We must have the written ruling in order to apply for Jamil’s passport. Maybe, it would be ready the next morning. It was not. However, we were called on Thursday, it was ready and we could go to turn in the passport paperwork. Previously, passports might take 1 to 3 days. Now, at least 10 business days. What????? God is good all the time, all the time God is good. At this point, is when we decided to get back to the States and return when the paperwork was completed, and we were ready for the visa interview. Jamil would stay with Pastor Fred. Jamil feels very at home with Fred’s family. Actually, Jamil and I were going over the work he could do on his own from his books when the text came in saying his passport had been approved. It would be printed and signed, ready to pick on Wednesday. God is good all the time, God is good. So as I stated previously, we changed our flight and began to think through the possibility that we would all three fly home on early Saturday morning!! Tuesday, we went to the attorney’s office to gather a few documents we would need for the visa interview. Tuesday night, as we returned to our guest house, Jamil informed me that he “was paining” around his closed eye. Only hours before, I had been asked, in a Facebook post, how he was feeling and had replied that he was feeling fine. We have been doing a lot of work on English and reading as well as math to fill our days. One goal I’ve had is to help Jamil to catch up to the students his age in school. He is in P-3 (primary 3) and according to his birth certificate, he will turn 13 on the 17th of October. He is so very smart. He has a quick wit. He can speak several languages. I do not want him to lose this ability. We also want for him the same thing we desire for each of our children. We want him to follow the God’s will and call on his life. At this point, he wants to become a doctor. Remember, I said discernment can be hard? 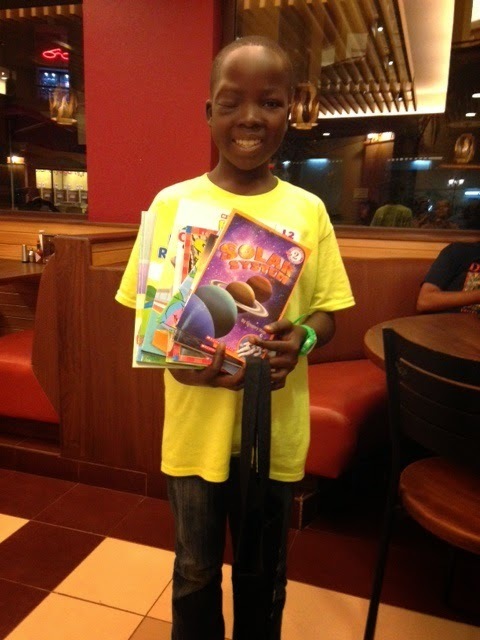 We knew, if Jamil’s tumor had returned we were to do everything we could to bring him to the US. Before we knew his tumor was back and we were in Palissa having a medical clinic at Jamil’s school, I was so proud of Jamil as I watched him become a translator for Jay and April. As he was doing this, I asked another translator to tell his grandfather who was standing there, how proud I was of Jamil. The translator did, then he began to laugh at Jamil’s grandfather’s response. I asked “What did he say?” He told me Jamil’s grandfather wanted to know if I was ready to take Jamil back with me? What????? This had never entered my mind. But, I must admit it did plant a seed. I started looking back to the Know More Orphans conference Jayne and I attended in Alabama. Why did we go?? I knew the reasons at the time, but could there be more? I have stated previously, “I would never be able to home school, yet here we go in the fall!” I’ve learned never to say never. Two things that resonated with me at the conference: One was a father of an 18 year old adopted son from an African country. As he had grown, this young man had made some painful choices for not only himself, but for his parents as well. He was now making better choices, but this dad wanted others to learn from their journey. He asked his son, “If there is one thing, you would have me tell these potential adopting parents, what would it be?” He told his dad, “Never take the child away from his culture.” This statement leads me two the second thing I took away. I was thankful that the conference didn’t define orphan care as adoption only. I was somewhat hesitant that I would walk away feeling guilty for not choosing adoption. Not so. But now, was Jamil’s grandfather serious? It did start a conversation in our family. One that we will continue to pray about and believe the Lord will give us the discernment in His timing. I must confess, I have no idea if we are to officially adopt Jamil or not. I can tell you in my heart, he is already part of our family. I had a friend once tell me the Lord had shown her a veil in her future. He told her not to worry about what was behind it. She was to walk on the path that He had showed her at this time. We know the Lord has called us to bring Jamil to the US for treatment. After our kids left to return to the USA, we had to change guest houses, due to another team coming to the one we had stayed in most recently, next to Gabba Community Church. Our friend, David Gitta, introduced us to Kate and Jemimah. They have a guest house that is just a short distance, around the bank of Lake Victoria, from the apartments that we stayed in back in 2012. I know God planned this move. Their guest house is a beautifully relaxing home and they became family to us. I think we needed time and wisdom from Kate to help Jamil transition from the culture he knows, to one that could potentially be overwhelming. She has been a valuable resource in this area. So we are planning for him to Skype call his family and David, at least once a week, while he is in the US, with us, to receive treatment. Our temporary guardianship orders forbid us to adopt Jamil, while he is in the US for medical treatment. Therefore, this process which we started June 5th, for guardianship, would start again, from square one, if we discern that adoption is God’s will. God is good all the time, and all the time God is good. Kate, Jemimah, Jamil, Jay, and I went to dinner Wednesday night. It was very quiet as we sat through the first part of the meal. Jay received an email which made us realize we have no idea the time frame for the visa through the US Embassy, even after we get the passport. We were perplexed, as we knew that God had moved so many things forward miraculously, but we also realized that Jake, Jared, and Jayne had now been in the US for two weeks. Jake moves to Southwestern Oklahoma State in Weatherford on August 16th. Jay has some work shifts scheduled in the coming weeks. We have to get our homeschool curriculum organized, for August, for Jared and Jayne. What do we do now?? Kate encouraged me by reminding me we have been praying for God’s will. He has a plan and a purpose. Jay knew he must come home soon. I felt I was in a no win situation: to stay in Uganda, for God only knows how long, with Jamil as Jay returned to the States was weighing heavy on my heart. That was coupled with me missing our kids and the last couple of weeks, with Jake, before he moves to SWOSU. I decided to fast and pray on Thursday for clarity. God has always been so faithful to answer prayer, with such clarity, while I’ve been in Uganda. What and why was this so hard to know what to do??? Why did it seem He was so quiet and not so near? I know it only takes the faith of a mustard seed to move mountains. He’s already moved several during this process. I know He could still make everything fall into place. I was believing Him for this, knowing at the same time, He is the Alpha and Omega. His will, not mine. I don’t have to worry about the outcome, He’s in control. I was not okay with leaving and not okay with staying. I was tempted to question my faith. Thankfully, I decided to focus on the way out of that temptation, even if I didn’t understand it or feel like it. I had to consciously choose to do this. Thursday by midday, we still had heard nothing about Jamil’s passport. In fact, now the attorney was unsure if Jamil’s passport had even been printed or if we were waiting only for the needed signature. I received a message from Tana on facebook, asking me to please tell her that we had received the passport. When I let her know we hadn’t, she shared she had seen on a news website that the computer data base, of the US, for passports and global visas had a glitch, thus slowing down the ability, all over the world, to permit visas. Seriously??? When we looked it up, we discovered one country alone had a backlog of over 50,000 visas to be processed. The article stated it would cause hardship for many. You think? God is good all the time, all the time God is good. That little nugget of glorious information is what the Lord used to break my stalemate. Jay and I were to come back to the States and one, or both of us, will return once the paperwork is processed and we have an appointment for the visa interview. The Lord was now clear. Yet, my heart hurts to leave. We found out we could fly early Friday morning instead of waiting until Saturday morning. As Jamil and I went over his books and work for him to do during the next couple of weeks, he was so quiet. We talked about knowing we can trust God and His plan. Tears and hugs followed. I’ve blogged before that Proverbs 3:5-6 is my life verse. “Trust in the Lord with all your heart and lean not on your own understanding, in all your ways acknowledge Him, and He will make your path straight.” As the Lord teaches me by gently pealing back another layer in our relationship together, to trust Him no matter what, I realize that “straight” isn’t necessarily a straight line. It can be very bumpy and curvy like the roads in Uganda. But, it means He will show His plan by yieldi discernment in His time, not mine. I can trust by faith, not feelings, that He is in control, when it would seem He might not be. So, I started this blog in London and am finishing it as we are flying to DFW, without Jamil, at this time. As I type these words, my eyes are blurred with tears. But, I don’t have to worry what others might say or think, as I abide in Him. He wins! By faith I trust He will receive all the glory! He never said our path was easy, but I can trust He is guiding me down it. I miss Jamil already! As we are waiting for the paperwork to be completed for Jamil to travel, I am reminded about our expectations. We expect that when we flip the light switch, the lights will come one. We expect that when we sit on a chair, it will hold our weight. We expect that when we get sick, we can receive treatment. I could go on and on as we expect so much. Are our expectations realistic? On June 4th of 1996, I graduated from the University of Oklahoma College of Medicine. The next month, on July 1st, I started my training in Emergency Medicine. Since that day, I have worked in many different hospitals and treated thousands of people across Oklahoma. Some of these hospitals were a part of my training and many have been since my formal training was completed. I want to be clear that the quotes and phrases listed below were not sanctioned by any of these hospitals, nor were they said to any patient. These are things that I have thought, overtime, as comic relief to stressful situations. They may have been shared with the nursing team or other doctors, but were never relayed to patients or their families. There have been times, usually in the winter, where ERs are inundated with kids that have fever. Fever, on its own, is a natural and helpful response that the body has to infection. In kids, this is usually caused by a virus. Young children will mount an impressive fever to the same virus that might only cause adults to have a runny nose and feel a little fatigued. So after the 100th patient that showed up in the ER with a fever, I developed a new phrase that I thought the operators should answer the phone with. “Hello, this is XYZ hospital, where fever is OK, how can I help you?” After contemplating this for a while, I figured this would cause more questions than it would solve problems. I have come up with another thing that I thought would “help” with phone answering. The ER could be quite busy and we would receive calls from people asking if there is much of a “wait”. As you might know, treatment in any ER is not based only on when people arrive. Patients are triaged and the sickest go first. Usually, if someone has time to check to see if it is a convenient time for them to come to the EMERGENCY room they are not very sick. So I thought it would be good to have a pre-scripted response to the “How long is the wait” question. The person answering the phone should say, “If you have a true emergency, there is never a wait!” This too never happened but made me feel better at the time. Speaking of triage and how patients are put into the treatment order, there is another factor that I think should be considered. If the patient and their family stop off at the local convenience store for a “jug-o-cola” before they come to the ER for their abdominal pain, they may not be as ill as they think they are. Trying to convince me that you have 10 out of 10 abdominal pain while you play angry birds, sip on a Pepsi and eat a moon pie is a hard sell. I have millions of anecdotal phrases and scenarios that I have come across in the 10’s of thousands of patients that I have treated in the past 18 years. But the reason I have mentioned the ones above is to get to this one. One of the most frustrating issues with being an ER doctor is dealing with expectations. There are expectations that the hospital has that I treat patients well, in a cost effective manner and in a way that receives good scores on the patient satisfaction surveys. The government has expectations that we have to see everyone, no matter if they have an emergency or not. The DEA has expectations that we are very careful and judicious in the use of scheduled medications. Nurses have expectations that the doctor is competent and will write orders in a way that is logical and makes good use of their time. Malpractice attorneys expect that despite our textbook treatment of patients, bad outcomes will eventually occur and put food on their table. Insurance companies expect that we will spend 3 times as much time charting our care of the patient than we spent actually caring for the patient. All of these are fine, but to succeed as an ER doctor, you have to identify and then address the patient and family expectations. By “address” I don’t mean that you necessarily have to meet them, but I need to acknowledge them. Sometimes, identifying and addressing patient expectations is easy. Sometimes it is difficult to determine what the expectations are, but once I do, they are easy to address. The most trying times, however, are when the expectations are obvious, but they are unrealistic. I have had families bring in an elderly parent at 11 pm on a Saturday night for a problem that has not recently changed and has been present for months. Perhaps the patient has been weak with no appetite for 6 months. They’ve had many tests and work ups via their primary doctor and associated specialists. Despite this work up, the problem persists and has prompted an ER visit at 11 pm on a Saturday. The expectation is that the patient gets admitted and the problem solved. My dilemma is to figure out how to do either one of those things. Another example of expectations askew, is when someone comes into the ER at 2:00 am with back pain that has been present for 2 years. No new injury or worsening of the problem. They’ve had an MRI and seen a back specialist. The patient takes pain medicine chronically and has plenty of that available. I guess that they expect me to solve the problem, but given the scenario, this is unrealistic. So, believe it or not, I have come up with a new XYZ hospital slogan. “Welcome to XYZ hospital emergency room where we specialize in meeting your unrealistic expectations. How can I help you?” This too has never been approved or used in any hospital, just in my deranged mind. The reason all of this has occurred to me has been my unrealistic expectations over the past 7 weeks. Each time that we clear a hurdle in the race to get Jamil’s paperwork together for him to come to the USA for medical treatment, I grossly underestimate the next hurdle. For instance, when we get X done, it should take a day or two to get Y done. That lets us get Z done by Friday so we can fly on Saturday. In each of these steps, I have brought expectations. Each time they have been unrealistic. I frustrate myself because I can see myself as the family with an elderly loved one that wants them fixed in the night on a weekend. As soon as I notice it, I fall into the same trap again. It is so infuriating. You might call it a miracle, but I am still praying that God will meet our unrealistic expectations and we will travel, with Jamil, soon. This year’s Due Unto Others mission trip has been such a blessing. 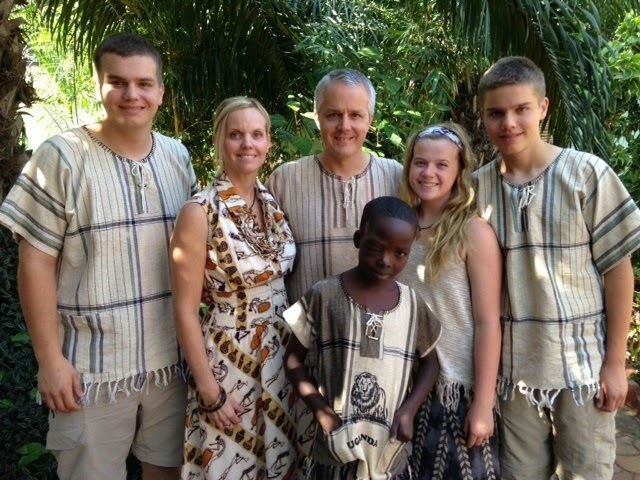 Most of our team members have returned to the USA, but Jill and I are in Uganda a little longer. We’d like to thank our Due Unto team members: Mason Lang, Anna Catherine Ortego, April Berry, Faith, Joseph, David, Raphael, Sarah, Ronald, Frank, Joyce, Julie, and Dr. Martin. We have made many new friends and seen many lives changed in the past 7 weeks. Our team has seen and treated over 4,600 patients in 23 clinics. Due Unto Others supporters have helped to provide free medicine to these 4,600 people. Many of whom would not have been able to get the medication on their own. We also provided more than 400 people with reading glasses free of charge. Perhaps most importantly, we were able to hand out more than 500 copies of God’s word to those who were eager to have a bible of their own and to read it intently. Each of our 23 medical clinics has contained a “spiritual clinic”. This is an area where the people that have come for medical care can pray with a pastor and hear the Gospel presented. We have seen more than 200 people take the first step into a new life in Christ. Now, Jill and I are being forced to settle into dealing with patience, rather than patients. It is a little difficult to slow down after going so fast during our scheduled part of the trip. We have received a verbal ruling from the judge, granting us temporary guardianship of Jamil. This legal guardianship will allow us to travel with him and consent to medical procedures, for him, in the USA. We are now waiting for the official written version of the ruling so that we might start the process of procuring Jamil’s passport. After we have the passport, we can apply for the US visa. Let me give you some updates on a few of our “that one persons”. 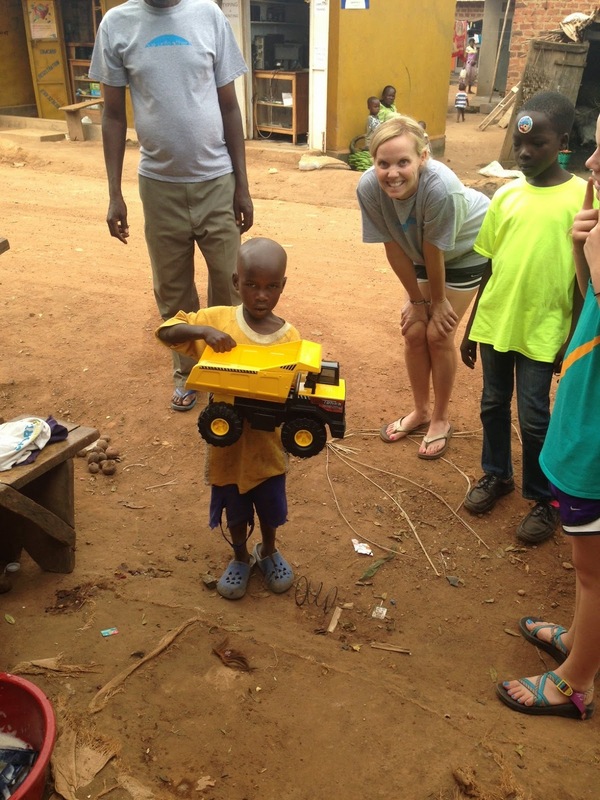 Our friend, Jonathan, is doing well in Gaba. He is the boy that suffered significant burns in 2012. We saw God heal his burns in a miraculous way. Due Unto Others is supporting Jonathan with a school sponsorship. We made arrangements for him to be seen by a general surgeon at Wentz Medical Center last week. Jonathan has been scheduled for a surgical repair of a large umbilical hernia on August 6. Please keep this miracle child in your prayers. 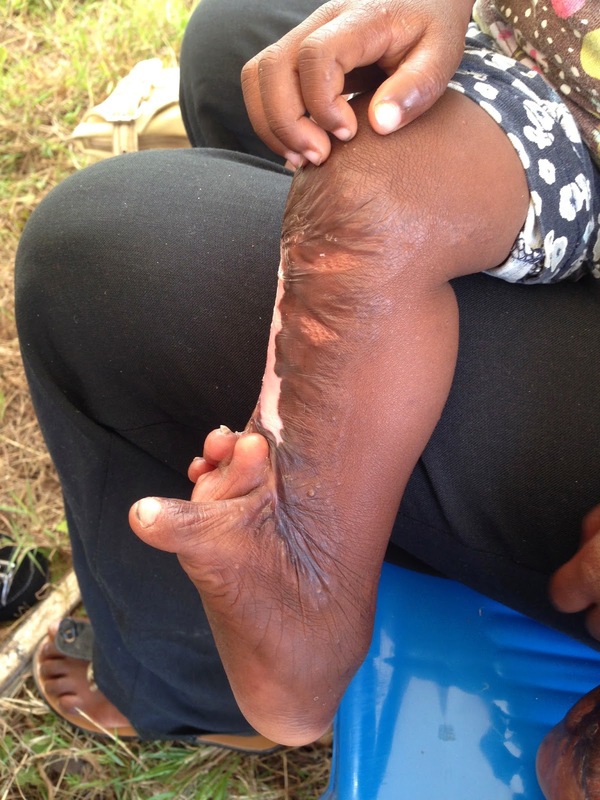 Chrispus, our TOP from Ishaka had a surgery to release some scarring of her foot and ankle. Take a look at these before and after photos! Due Unto Others supporters made it possible for this surgery to take place. This girl will now be able to walk and attend school. What a difference for Chrispus and her future! Remember Gift? 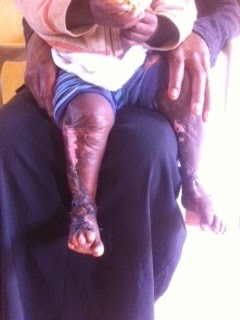 He is the young boy, from Ishaka, that had a bad bone infection in his leg. His care was paid for by Due Unto Others supporters. He is now out of the hospital after a few weeks of surgery and IV antibiotics. This is a quote from Pastor Sam of the newly formed Ishaka Community Church: “The whole community is glorifying God for this act of faith and this Sunday I have invited them to church to give testimony.” We can make a difference, one person at a time! Pamela, from Bwambara, is going back for a recheck on her heart next week. She may end up needing a heart surgery, but so far she has been stable. 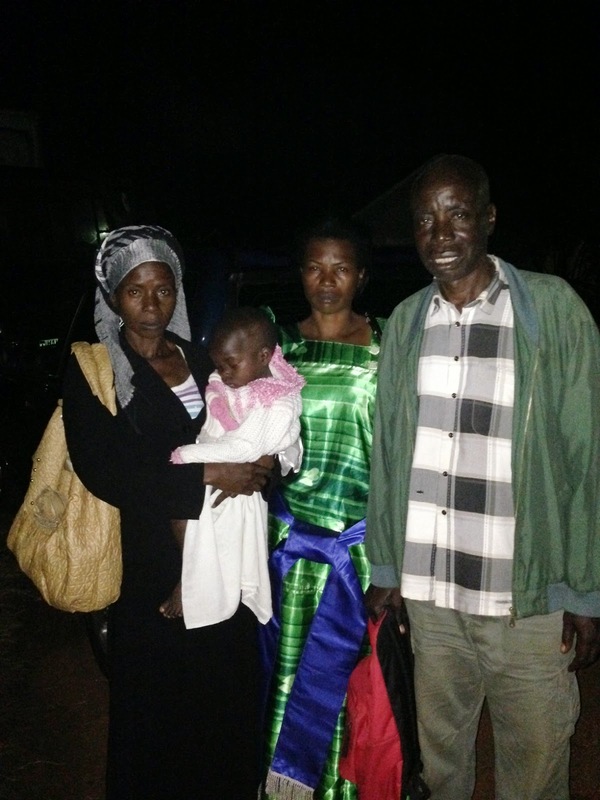 Her family is so excited to see her moving towards a diagnosis and possible correction of the medical problem that has caused her to not be able to attend school. I will keep you updated on this as we move forward. Elizabeth, from Rukungiri, came to Kampala with the thought that she would need a bone marrow biopsy. She had been dealing with a chronic anemia and it was feared that she might have some sort of leukemia. Thank the Lord, when she came to Kampala, her cbc showed that her anemia was much improved. She was allowed to go home, with a follow up appointment but it was not felt that she needed to have the bone marrow biopsy. We have heard good reports about Emmanuel. He had a large and cloudy left eye when we met him in Bwambara. He had a surgery and was diagnosed with congenital glaucoma. The affected eye was removed and the other eye was checked and had normal pressure. 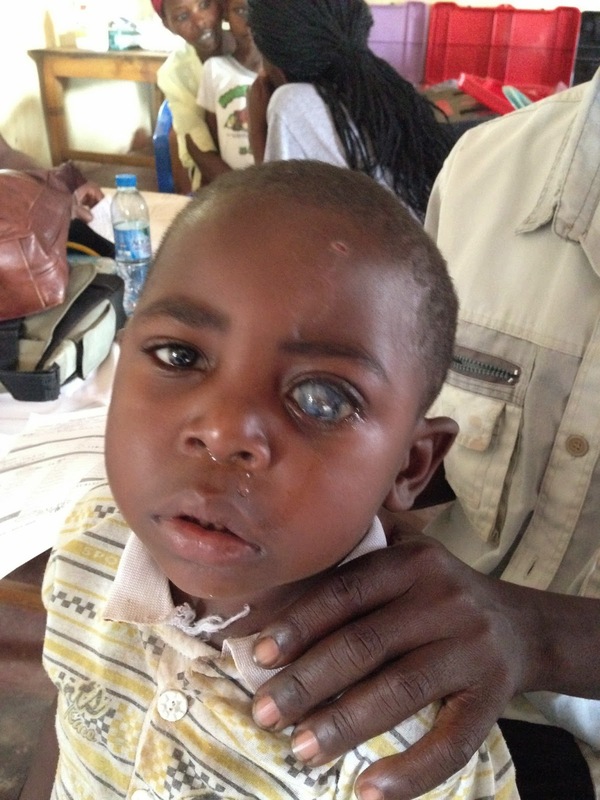 Emmauel is set to get a prosthetic eye next month and his parents say that he is doing so well that they will be starting him in school by the end of the year. 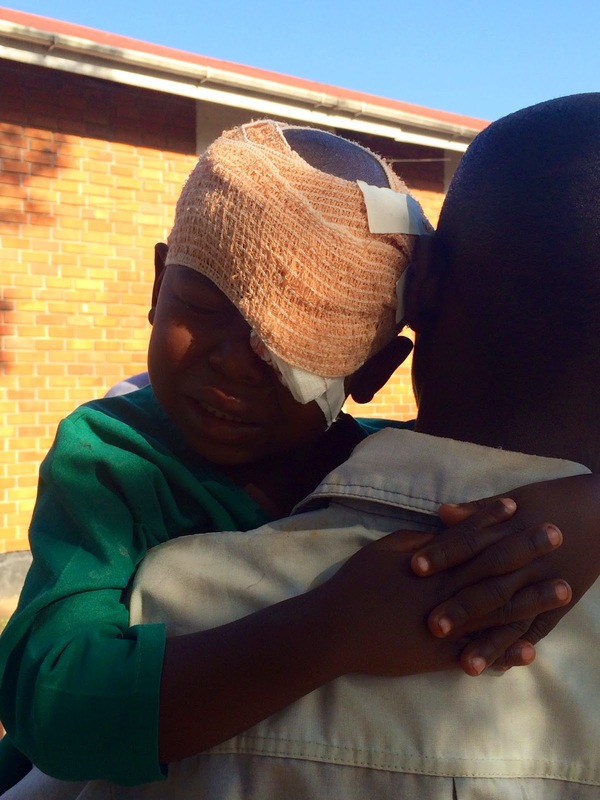 Due Unto Others supporters have completely changed the life of this little boy. So please continue to pray for our patients and our patience as we continue to prepare for “Due Season”. As most of you know, our friend Jamil has suffered the recurrence of a meningioma behind his right eye. He had a surgery to remove it in 2012, only to have it recur in 2013. At that time he underwent a second operation and then radiation. This year, as we went to Pallisa, he looked so much better. Jamil was doing well in school and had gained much ground on his English. As we sent him for his 1 year follow up, we were hopeful that the tumor was a thing in his past. On June 5th, we received word that his CT scan showed that the tumor was back again and moving closer to his brain. Jill and I had been impressed, by God, that if Jamil’s treatment in Uganda was unsuccessful a second time that we should try to bring Jamil back to the USA for treatment. 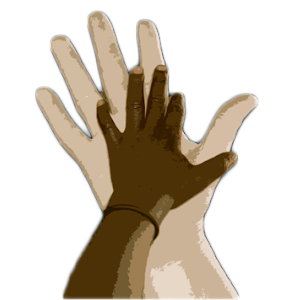 There is a lot that is involved to get custody of a child to take them from Uganda to the USA for medical treatment. Both countries want to make sure that it is best for the child and that those taking him or her have the best interest of the child in mind. So we knew that it would be a miracle if we could get it all done before our scheduled departure 5 weeks later. We knew that God had a perfect plan for this situation, but we wanted to do everything that we could to get the needed paperwork in order. In my mind’s eye, I thought God could get the most glory by waiting to the last minute, then making dominoes fall in order. I could see the story book ending where we got everything done at the last minute. We leave from the US embassy with a visa that was fresh off the press and still too hot to touch. We race to the airport and then run from one end to the other and jump on the plane, like Indiana Jones as they are closing the door. We relax in our seats, take a deep breath and then blog about how great God is. God obviously has a plan to bring Himself more glory. At this point, we are getting closer to a conclusion. We will get a ruling from a judge this coming Tuesday. If that decision is to give us custody, we will then be able to apply for Jamil a Ugandan passport. Once we have the passport, we can apply for a US visa. I went out for a run this morning. This is actually a rarity lately. I think that I have only run 5 times in the past 7 weeks. As I headed out from our guest house, my phone started up with the song, Waiting Here for You. So God impressed on me that I need to forget about the story book endings and wait for Him. This is a lesson that I need to relearn fairly frequently. This was especially pertinent as I was thinking about what we had done in the 24 hours from 11:30 pm on Thursday night to 11:30 pm on Friday night. Since we were not quite done with everything that would make Jamil legal to fly, Jill and I have postponed our tickets. Thursday night, however, was the scheduled departure time, and Jake, Jared, and Jayne kept their tickets and were heading home. We dropped them off at Entebbe airport with step by step instructions from when they entered that airport until they stepped out of the airport in Dallas. So over the above mentioned 24 hours, the kids covered 3 continents and an ocean to travel home. Jill, Jamil, David, and I got up early Friday morning and headed off on a scavenger hunt. We needed documentation of some things and some legal paperwork completed that could be needed to get the US visa. We left Kampala at 8:00 am. We arrived in Iganga about 10:45. There we met up with Jamil’s Aunt Margaret and Uncle Joseph. They would be instrumental in helping us navigate the scavenger hunt. We set out from Iganga on dirt roads, to the south east. After driving, for 2 hours, through some beautiful, Nat Geo-type landscape, we came to Bowdha Beach, a small fishing village on the shore of Lake Victoria. This was the last known location of Jamil’s biological mother, Robina. I was concerned as we first started to look for her, because we were not making much progress. Eventually we found one of her daughters and she thought that she might know where Robina was. We followed her to the far side of the village before we realized that this 4 year old didn’t have much more of an idea than we did where Robina was. We had located Robina’s house, but she wasn’t home. So we decided to wait for her to come back. As I sat there and prayed, I was thinking about how frustrating it would be for us to travel 5 hours to find her and not be able to see her. To pass the time, I asked Margaret and Joseph a few questions to try to piece together the needed affidavits for the US embassy. Before too long, the Mzungu (me) had become the attraction in the village. Many kids, that I am sure had rarely, if ever, seen a white person before, came to give me five or dodge me tickling them. I was sorely wishing that I had brought our medical trunks, as there were many kids that were sick. Almost all of them looked very poor. A majority of them were school aged and looking at me on an early Friday afternoon, rather than a teacher and chalk board. Eventually, Robina returned home with Jamil's 3 half sisters. She immediately recognized Joseph and Margaret. They had a short reunion, then Joseph told her who I was and why we had come. We needed her consent to have temporary custody of Jamil, despite the fact that she abandoned him 11 years ago and had not participated in his care since then. She seemed hesitant, but an old lady that had come up to visit with us, while we were waiting, convinced her that it was the right thing to do. She agreed to consent. So we asked her if she knew of any paternal uncles for Jamil. She said that she did, but our best chance of finding them would be to take her with us to a place that was out from Jinja. About the time she was getting her things together, her current husband arrived. He was nice to me, but he seemed hesitant to let Robina go with us, unless there was something in it for him. It must have been the prayer cover, but he eventually relented. Before leaving Bowdha Beach, we stopped at the LC1’s office. This is like a mayor of the local area. He signed a letter stating that Robina was known to him and lived in that community. So we took off again down the bumpy road, heading back to Jinja. It was 3:15 when we left Bowdha Beach, and 5:00 when we got to Jinja. We took off to the north from Jinja. Again there were bumpy roads, but this time, the roads were muddy instead of dusty. About 6:15 we arrived in Budima. After some reunions, for Robina and Margaret with people that they knew in the area, we were taken to the grave of Jamil’s biological father. Jamil never knew him, as he left when Jamil was very young. We took a photo and some testimony from his family. We then went to the LC1 in this region. They wrote us a letter stating that they had known Jamil’s father and that in fact had died in a motorcycle wreck. This will be proof that we only need consent from Robina. This LC letter was written with a flash light, as it was almost completely dark. We left Budima and headed back to Jinja. We arrived in Jinja a little after 8:00 pm. Now, since it was too late to send Robina home to Bowdha Beach and the other two to Pallisa, we searched for a hotel where they could spend the night. There was some sort of trade fair in Jinja, and the hotel rooms were scarce. We eventually found them lodging, left them money for food, and said goodbye. We then stopped at a convenience store to grab some things to eat (first time since breakfast) at about 10:00 pm. After a short stop there, we traveled back to Kampala, getting back to our guest house about 11:30 pm. As we were pulling down the road to our guesthouse, I got a text from Jake that said that they had landed in Dallas. This had been a very busy 24 hours. So this is a great time to “wait” after all of our “going”. We have no clinics scheduled this week. We will be waiting here for Him, to open the doors for us to come home. Would you rather be "Right" or "Righteous"? This is a warning to all readers. This blog contains discussions of a controversial nature. Even though the text will seem accusatory in nature, the finger pointing is a generalization and is not meant to be inclusive of everyone in each listed group. Now back to your normally scheduled reading. Today, I want to discuss a topic that God has been teaching me about for the past 13+ years. I have by no means mastered this, but God has brought it to my attention again over the past couple of weeks. The topic is this: Are we as Christians more concerned with being “Right” than we are with being “Righteous”? Another way to look at it is are we more fixated on the “Process” than we are with the “Provider”? I feel that many of us, as Christians, spend more time finding faults with other Christians and other denominations than we do finding what we have in common. I have to admit, up until I attended a Walk to Emmaus weekend in 2001, I thought of other Christian denominations in how we were different. For instance, we were different from X denomination because of our beliefs on Baptism, or we are different from Y denomination on how we worship. As I spent time, in 2001, with Christian men that were Methodists, Church of Christ, Baptist, Nazarene, non-denominational, and others, I learned that we had much more in common than we had disagreements. The main things that we had in common were a love for Christ, the belief that He is the son of God, He died for our sins, and that our only way to heaven was through His grace and our acceptance of His grace. I have seen that we, as American Christians, can easily find fault with people and churches that do things differently than us. I recently saw a Facebook post that was making fun of Life Church and the “video preacher”. The comments that followed the post continued to post jabs at the way Life Church reaches people. This struck a little close to home, as we attend Raw Church, a network church of Life Church. I did not post a comment on this thread, as God has been working with me on this issue. Even though Life Church does things differently, we cannot deny their reach into the non-churched. They have given away over 1 Billion copies of the bible on phone apps. They also are able to reach into countries where Christianity is forbidden, to unchurched people, by internet worship services. I am not saying that their plan is the best way or that it the only way, but it is an effective way. Let’s celebrate the successes of other churches, rather than pointing out their problems. As I mentioned, God convicted me of this issue at an ecumenical meeting of men. This, by no means, is the only way to grow in your walk with Christ. I cannot be narrow minded and just think that if everyone attended an Emmaus weekend, all Christians would live harmoniously. By the same token, if there was a certain type of worship that led you to the church, don’t think that is the only way that people can be attracted to church. I’ll be honest with you, I feel that the reason God brought this up to me again recently is related to the work we have done with Jamil. I found myself praying that we can get everything done to get him to the USA for medical treatment. This desire to get him to the USA is for medical treatment and cure. BUT, I know that the thing I should be praying for is healing. God is not concerned with the process, because he is the Provider. The end goal is not to get him to the USA, it is for him to be healed. I know that this will work out, in some way, so that God receives the Glory. Let this list of differences run together like voices speaking them out loud in your mind. To quote the American liberal progressive, Hilary Clinton, “At this point, WHAT DIFFERENCE DOES IT MAKE?" 3.) Show grace and tolerance to those that are serving and worshiping God in a slightly different way. I’ve heard it said that we as Christians need to work as Christ’s church, or the capital “C” Church and not as our individual churches. I wholeheartedly believe that for us to truly see revival in the USA or to reach all of the people groups, God’s children will have to work together as the “C”hurch. A big goal of international missions is to reach all of the people groups, of the world, so that it will open the door for Christ’s return. I heard a speaker at an international missions event say one time, “If we as Christians and individual churches focused all of our energy and resources on reaching every last person on Earth with the message of the Gospel, we could accomplish it by next Thursday". The sobering question is why don’t we do that? Are we more concerned with proving that way we do it is “right”? Do we think that since our “process” worked for us that it is the only way to the “Provider”? Are we worried that someone else or some other church would get the credit? I truly do not want to stand in front of my Jesus and have to explain to Him why I used my gifts and resources to bring another Christian or group down in order prove that I am “right”. Take some time today and think about what God might have to say to you about this. Let’s use our creative energy finding ways that we as Christians can work together to reach our world. Are you preparing for “Due Season”? Have you ever noticed that sometimes the best things come out of difficult circumstances? I am sure that each of us can think of examples in world history, American history, Church history, our family history, and even in our personal history. For me personally, some of my best individual accomplishments took quite a bit of training or effort. Things like running a marathon, completing a half ironman triathlon, and even graduating from medical school. I’d like to go back to last week and tell you about our clinic in Ishaka. We were scheduled to work clinics, in a tent, on the property of the soon to open Ishaka Community Church on Thursday and Friday of last week. Ishaka is a town with a heavy Muslim influence. There is a private university there that was heavily funded by a Muslim family. As we set out on our trip to SW Uganda, it was still not clear if we would be “allowed” to host the clinic in Ishaka. The District Health Officer (DHO) said that there had recently been a medical team in the area and that another medical treatment camp was not needed. It was felt that this rejection was likely related to the fact that it was a Christian medical camp. After some repeated efforts, the District Health Officer still rejected the request. Leaders of the church sought counsel with the Municipal Health Officer. This is a lower ranking official, but closer to the city. The MHO decided that permission from the DHO was not needed if he, the MHO, approved it. So we got approval through the MHO on Monday, to host the clinics on Thursday and Friday. Even as we got up and had our team meeting on Thursday morning, we were still a little uneasy about what the day might hold. When we arrived in Ishaka, there were many people there waiting on us. 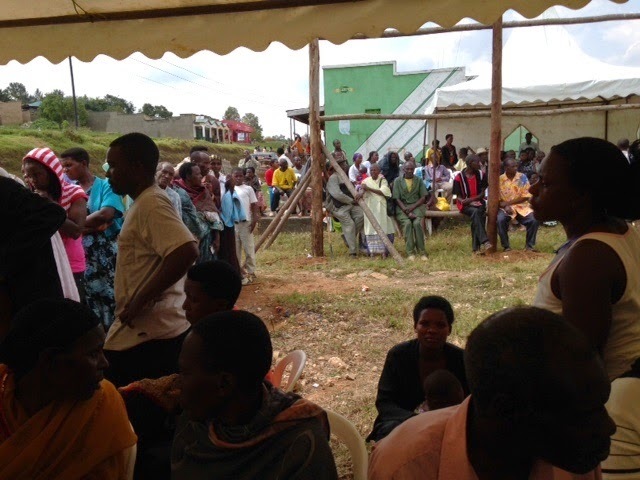 The need for medical care was evident by the number of people waiting, and by the type of patients that we treated. I noticed that there were two armed police officers at the site of the clinic. I thought this was a little strange as we do not normally require armed guards for our clinics. I thought that perhaps the church was being extra cautious due to the circumstances. We started the clinic and things were going very much like they do at other clinics. After a few hours it got dark and started to pour down rain. Since we were in tents, our team had to help hold one side down to keep the tent from blowing over and in on the other tent, we had to use some of the older patient’s walking sticks to lift the roof of the tent, in places, to make the water run off. The patients all crowded under the tents to get out of the rain. In the middle of all of this commotion, a small Toyota car pulled up into the middle of the property that we were working on. They stopped in the middle and started honking their horn. It made me think that perhaps they were carrying a really sick patient and needed to have some help getting them out of the car. This would be unusual because almost no one that we treat in our clinics, drives to the clinic. They almost always walk or arrive by some means of public transport. I got distracted with the rain and tent and forgot about the Toyota, until they started to drive away and got stuck in the mud of the property. The rain eventually stopped and we finished a muddy clinic day on Thursday. We went again on Friday and the crowd was even bigger waiting for us. That clinic day went well and we treated almost 500 people in those 2 days. As we were finishing our packing, we were talking with the local pastor. He indicated that through sharing the Gospel, at the medical clinic, more than 50 people had given their lives to Jesus. Additionally, the goodwill in the community had been substantial. The Ishaka Community Church was opening in a little over a week, and they had a full head of steam. As we drove back to Mbarara, from Ishaka, Dr. Jonathan told us the rest of the story with the Toyota car, the day before. It seems that the car was full of district officials that had come to shut down the medical clinic. They had the chief of police with them as well. When they pulled up to the church site, they pulled in and honked the horn, because they did not want to get out in the rain. Pastor Sam had gone out to greet them, under an umbrella. The church leaders had suspected that this might happen, so they had brought all of the letters of permission, with signatures, to the clinic site. The officials bluntly had told Sam that they had been clear that this event should not take place. Pastor Sam graciously provided them with the signatures and letters of approval from the MHO. The officials looked them over and then declared that the law requires on site security for an event with this many people. Pastor Sam calmly pointed out the 2 police officers that were under the tent. Stunned by what had just happened, the officials rolled up the window on the Toyota and drove away (after having to maneuver back and forth to get unstuck from the mud). Seems that God may have used a storm cloud of distraction to keep the officials in their car and to not even allow any of the Due Unto team or clinic patients to know what was going on. I think that He may have enjoyed a little fun by getting the Toyota stuck in the mud! 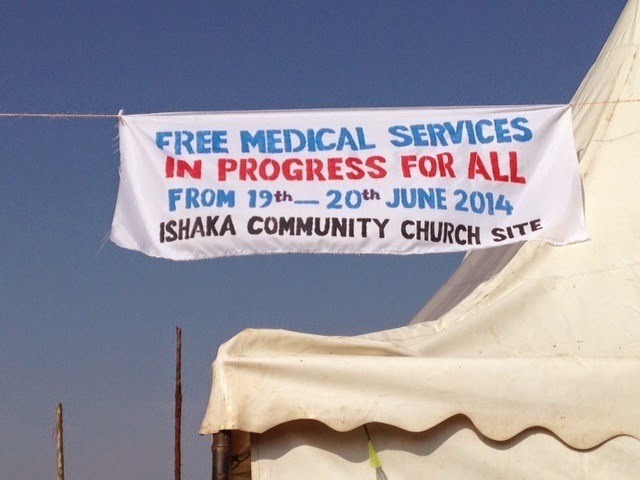 There had been great opposition to a Christian medical clinic in Ishaka. 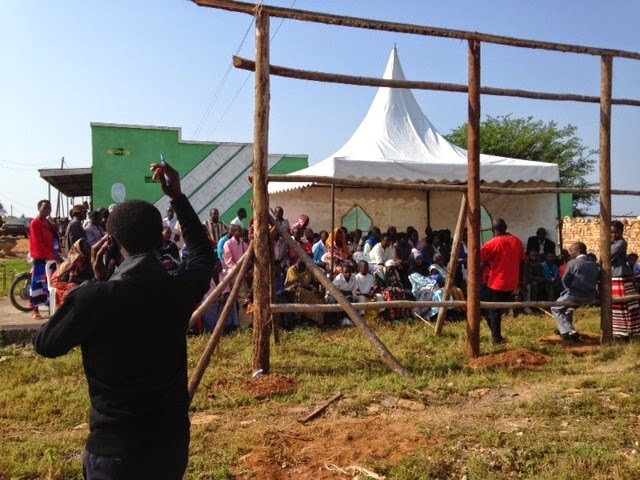 Through prayerful persistence, the leaders of Ishaka Community Church boldly pushed forward. Our team was a little skeptical, as we had never been “unwanted” in a town or village. We boldly stepped out and went to where we felt God was telling us to go. As God helped everything unfold, we had one of our most successful clinic ever. It was a success in the number of people saved and in the severity of illness that we were able to help with. Despite what the DHO thought, this clinic was needed, both spiritually and physically. Do you remember those police offers that had been hired? Their presence not only allowed Pastor Sam to stand up to the District Officials, but one of them prayed to receive Jesus! The other officer was already born again. We were able to provide them both with copies of God’s word, in their local language. The officer that had just been saved proudly stated that he would be the first member of the Ishaka Community Church! When you find yourself in a tough situation or heading into the storm clouds of an unknown and potentially difficult environment, remember to be prayerfully persistent. Just out the other side of the storm cloud might be the rainbow of God’s great blessing! Continuing to prepare for Due Season!